Brecht Arnaert writes: 2012 has been a year of great turmoil for the euro. But our economy is not the only thing that is in crisis. Our economic theory is too, and even more so: for decades macro-economic policy has been conducted within a Keynesian framework, and while no Keynesian economist has predicted this crisis, or even is able to explain it’s causes, we are still listening to them today to get out of the mess they brought us into. I would say that this is a problem of legitimacy. I am telling this not only as an economist. I am a defender of liberty too. What is happening in Europe right now should not only worry economists, but every freedom-loving citizen. As we speak, measures are being taken to take away our liberties in a way that Hayek described so well in his “Road to serfdom”: each government intervention requires more government intervention, until no freedom is left anymore. Step by step our property rights are being eroded, and, not too far from here, in Brussels, a giant Moloch called the European Commission is centralizing powers with a speed that would have been unimaginable before the Treaty of Lisbon. If I can prove the claim that macro-economic policy destroys value, then the discussion about monetary policy is only a subset of this more general thesis. We will see that the euro is indeed a problem of forced valuation, and more specifically the imposition of a centrally planned quantity of money onto the public. It is the European Monetary System that determines what the quantity of money is, and therefore, in part, its value. What the euro is worth does not arise bottom up out of the interaction between individuals, but is decided top down by a few policy-makers, imposing their valuations on the rest of society. This cannot work, for reasons we will discuss in a minute. Apart from the problem of the impossibility of central planning, the euro is confronted with yet another problem, of a more political nature. Without judging the specific political reasons for setting up, not a European Central Bank, but a European Monetary System with now seventeen members, it can easily be observed that the euro is a system with ill-defined property rights. While every member of the Eurozone can print its own money, nobody is responsible for the purchasing power of the currency. It is this essential feat of the political architecture behind the euro, which is mainly causing its problems: if property rights are ill-defined, every body tries to externalize his costs. This is commonly known as “the tragedy of the commons”, as described by Garett Hardin, back in 1968. Meadows that are owned by nobody, but can be grazed by anybody’s cows, will be exhausted in no time. Currencies that are owned by nobody, but can be printed by anybody, face the same dynamics. The euro is a monetary tragedy of the commons. Let’s start with the proof that central planning cannot work. In his 1920 paper, called “Economic Calculation in the Socialist Commonwealth”, Mises demonstrates why that is: under central planning, there is no private property. If there is no private property, there is no exchange. If there is no exchange, there are no prices. And if there are no prices, there is no way for a central planner to allocate resources and labor, to know what needs to be produced, for whom, by whom and at what cost. By abolishing the institution of private property, central planners abolish the one institution that could make their plans work. Or in short: the only way central planning could work is by leaving the market free. It needs price information, which can only be generated in a free market. Most mainstream economists – Keynesians, neo-classicals and monetarists alike – to this day have not understood Mises’ fundamental challenge: how are you going to centrally plan what is needed if the information for that kind of planning can only be generated in a free market? How are you going to decide how many shoes need to be produced if there are no ratio’s of offer and demand? How are you going to decide whether the production of shoes is more urgent than the production of trousers, if there is nothing to indicate a rise in importance? How are you going to decide who is to make the shoes or the trousers, if you don’t know who can make them? How are you going to decide what the cost of that specific product should be, if you have no prices? The answer is: you can’t. The information you need to answer these questions can only be found in the price system, and it is exactly this system that has been abolished. It is startling to see how little economists really know about the workings of the price system. When I buy an apple, ceteris paribus, the price of all remaining apples raises. This price raise attracts entrepreneurs who see a profit in lowering the price of apples again. They start producing apples. Clean, simple. If I have to wait for a central planner to decide that an apple must be produced, I might as well just eat carrots. By the time he has – politically – decided which orchard has to produce that apple, has transmitted that order to Public Orchard nr. 56 and has replenished the stock of apples, I would already have starved. There is no system faster than the price system to transmit a change in market conditions. Now, do we live in a centrally planned economy? No. But whatever is valid in principle is also valid in degree. In a centrally planned economy the production of a citizen is expropriated entirely, and the state spends 100% of his income. In our economy the production of a citizen is expropriated only in part, and the state spends a bit more than 50 % of his income. But is there a difference in principle? Not at all. In both cases, there is only a difference in the degree to which the economy is centrally planned. Economists reducing the concept of central planning to the image of a Politburo full of high-hats deciding how many cars have to be produced in the next five years, miss out on most of the debate. The new central planning is much more subtle: the market is nominally left free – private property still exists – but that what you can do with your property is regulated and taxed to such a great extent, that free prices are practically impossible. Yes, the horse can run freely over the plains, but it has to eat this grass, use that saddle, let itself comb with this particular brush and has to be in the stable at that hour. Our prices aren’t free at all. How high or low they can go, is centrally decided. The margin by which they are allowed to fluctuate is still quite broad compared to full-blown communism, but that margin is diminishing with every new measure the government takes. Thus, the 1920 analysis of Mises, which indeed was originally intended as a critique of central planning, is applicable to socially corrected market economies too. In our economy, property rights still exist, but they are heavily burdened by taxes and regulations. Therefore, exchange rates are not what they should be, and the natural price mechanism that normally coordinates supply and demand is disrupted, the rate of disruption being the rate of central planning, which can be measured, in part, by the level of taxes. But whatever the level of central planning is, the crucial insight is that any disruption of property rights sends wrong price signals into the market, causing entrepreneurs to produce things there is no real demand for. Now that it is proven that central planning cannot work, neither in principle, nor in degree, it is easy to conclude that the euro cannot work either, since the euro is just another case of central planning, be it in a monetary form. Most people have accepted the fact that shoes and trousers cannot be produced through central planning, but though money is half of each transaction in the market, accepting the same idea for the production of money, for most people, is a bridge to far. Nevertheless, money is an economic good, just like all others. You cannot eat it, you cannot use it as a part that fits in the construction of a car, nor can you mow the lawn with it. It seems to be dead matter that has to be traded for something else, before you can actually put it to use. And this, precisely, is its function: serving only as a medium of exchange, not wanted for its own purpose, but to trade goods for goods. It has no other use than this. Money is hoarded because it can be traded against all other goods, and that is that. It is an economic good that has “gained currency”, very popular, but without trade, it is useless. One can have a backpack with one million dollars, wandering trough the desert, but money couldn’t by you a drink if there is nobody to trade with. Money in itself is useless. It is a unique social tool, that allows us to trade value for value. But just because money is a social tool, a lot of people think that it is a social convention. That someday, people decided that this or that would be money. This thought is not only wrong: it is the root of the problems we are facing today. For how did money come about? By government decree? No, by millions and millions of transactions in the free market. Before money arised from the market, there was only barter. One individual had a bit of fish, and some other a lump of silex, and an exchange took place. Or not. Because this is the biggest problem of barter: what if you really want that fish, but the guy does not want your silex? What if he only wants to trade his fish for a handful of berries? The only way to solve this problem is to look for a third trading partner that has a handful of berries. But that guy might not want your lump of silex either, but some wood for the fire. A fourth person has to be found. In the end, it is possible that a dozen of people has to be involved with one single simple transaction. And even then, not all wants are satisfied. Money solves this problem. It is a good that is accepted for any other good. Out of all the possible exchange materials (berries, fish, straw), free individuals selected that exchange product that would be the most steadfast of quality, have the longest sustainability in time, the easiest divisibility, the rarest occurrence, and the most obvious recognisability. These five main characteristics are what give a regular economic good a monetary premium. Now, if you apply these five characteristics to all materials you know, which ones pop to your mind first? The answer is: gold and silver. Out of all the possible forms of money, these two emerged as being the most wanted. The rest is history. Taking gold on a business trip soon became too dangerous, and letters of exchange were issued. These letters of exchange, first in person and payable for the exact amount, later on evolved to standard notes of a certain quantity. Notes we now know as bank notes. Gold was kept in the vault, and the notes issued against it were like the ticket you get from the cloakroom in the opera: if you want your coat, you can always get it. But imagine being a banker, storing all that gold, and seeing that nobody actually ever comes for it. The banknotes circulate in the economy, and nobody bothers to come and pick up their gold anymore. If on average only 10 % of the gold is ever picked up, then why not loan out the 90 % that is “just sitting there idle”? New banknotes are issued, for the same reserves, and all goes well. Only 10 % of the people comes to pick up their gold anyway. The banking business is truly a lucrative business. You namely did not give out the new banknotes for free, of course not, you loaned them out against an interest rate. So people pay you for using money you never owned in the first place. How good does it get? Pretty bad. With the evolving business of banking, bank notes only are a part of the money supply. Most of the banknotes have been dematerialized into bank accounts. This digitalisation in itself is not wrong. Whether one holds a property title in ones hand, or it is written in a book, or it is digitalized in a computer, the principle does not vary: one is entitled to the weight in gold that is represented by the property title. The most important thing is that these property titles are not duplicated, because that is where the problem really starts: if there are more property titles than there is property, each property title becomes worth less. This is what we call inflation. Inflation is what happens when somebody takes out a loan. Most people do not understand that the money they lend in the bank does not exist before they sign their loan contract. Just as bankers in the old days lent out money they didn’t have, the same happens today. The only difference is that when a banker commits this kind of fraud in a free market, he is evicted from the profession. 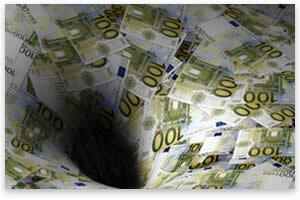 The word “bankrupt” comes from the Spanish “banca rota” which means broken bank. If competing bankers found out that a banker had emitted more notes than he had gold in store, his little wooden exchange table was broken. Banca rota, and the market was clean. Nowadays the banking market is one of the most regulated markets in the history of mankind. If I want to start a bank, I have to register with the central bank, which is not a public institution, but a private company that has been granted a monopoly to produce banknotes at will. The central bank determines the amount of reserves I must hold, in which products I can invest my money, what the tariffs are for interbank lending, and so on. Banking is as free as a fish thrown in the desert. You can do whatever you want, but you cannot swim, you cannot breathe, you cannot move. The central bank determines the environment in which you work. And that environment is very hostile to free entrepreneurship. Then where does the impression of recklessness of bankers come from? It seems like they can afford anything. They can ruin people’s lives by taking foreclosures on loans with money that they never owned, they can demand fierce reforms of public services without having to take any losses themselves. They can even rule countries, as we have seen in the case of Greece. The answer is simple: moral hazard. If you know, in advance, that you are going to be saved by the government, you will do as you please. The truth is that the government has no option but to protect the bankers, because its own survival depends on it. To understand this, we have to get into the intricacies of banking. If we assume that the total money supply is one hundred ounces of gold and only 10 % is ever picked up, then 90 ounces of gold can be loaned out again in the form of previously non-existing bank notes, or the equivalent of these put in a deposit account. But those 90 banknotes, let’s call them guilders, while being loaned out, are deposited somewhere in the banking system too. However, the 10 % pick-up ratio does not change. Only 10 % of these 90 guilders will ever be picked up. Then why not loan out 90 % of those 90 guilders? 81 guilders are created, and end up somewhere in the banking system. And the beat goes on. 72,9 guilders are created, and end up somewhere in the banking system. And the beat goes on. 65,6 guilders are created. With a reserve ratio of 10 %, out of each guilder, one hundred guilders can be produced. But what happens when more than 10 % of the people comes to claim their money? Then the banking system faces a real problem, because to be able to pay out one guilder, a lot of investments that were created on top of this monetary base have to be liquidated. And if a loan fails to be paid back, the same happens: on top of the money that was loaned out, a vast number of new loans depended. The only way to pay out those people, or to replace old debt, is to create new debt, which is mingled in with the old debt and the real money that was at the base of it. However, there is a price to this. The monetary base on which all depends, the gold reserve, in comparison shrinks with each emission of new money. What is backing the new “money” is not an actual value, but a future value: the promise that the people that have taken the loan, will pay it back after a certain amount of time. But the problem is: precisely by emitting more property titles than there is property, the whole price system is distorted. Price valuations do not reflect the true value of things, and the economic calculation problem grows. Less and less profits are made, and the loan is harder to pay back. With each monetary injection, debt not only rises, but the structure of production needed to repay the debt, becomes less and less efficient. Prices don’t measure value anymore. For instance, due to monetary injections, the price of capital becomes far too cheap. In a free market, the price of capital is determined by the amount of savings people hold. The more people save, the greater the supply of capital, and the lower its price. In an unfree market, like ours, the price of capital is determined by how many false property titles the central bank injects into the system, on top of which the commercial banks can expand even more. Since it is very lucrative to loan out money that one does not have, the price of capital drops far below free market levels. This has an enormous effect on the economy. An effect you cannot even begin to imagine. Most economists think that inflation is the worst problem when injecting money into the economy. Not in the least. Inflation is only the canary in the mineshaft of monetary policy. The true problem is that the structure of production of the economy shifts towards capital intensive sectors, while labour intensive sectors get weeded out. While you can buy IPads and Humvees and beauty treatments and luxury cruises and home cinemas and so on, you cannot find a plumber to do a little repair, a kid willing to help out at the bakers shop, or a stump of a guy willing to help the brewer to deliver his beer. These labour-intensive businesses can never compete with corporates for whom the most important cost is the cost of capital. A cost that is being subsidized by central banking. The effect is that there is a lot of highbrow consultancy, but no more service for the customer. A lot of expensive HR-philosophies, but stressed out employees “that need coaching”. A lot of fancy cars, but no social tissue that creates employment nearby, rendering these high-tech automobiles to luxury mobile prisons: big companies centralize employment, causing more long distance commuting than would be needed if the market was left free. The effects of centrally lowering the price of capital are so vast, but yet so subtle, that most people never even realize that a lot of the daily problems they have is due to the utter distortion of values, caused by central monetary planning. There is yet another problem. Because the structure of production is forced, it produces a lot of things people actually don’t need. I see twelve year olds with an IPhone 5, eighteen year olds with a Mercedes Benz and middle class people leaving on a holiday to the Seychelles like there was no tomorrow. Meanwhile healthy food, good education, and qualitative medical care is starting to become unaffordable for ever larger segments of the population. Again: it is not the task of an economist to judge the ends people are looking to achieve. We must take it as a given. But knowing what we know about central planning, and how it distorts the price system, it is clear that the true value of things is misrepresented, causing less value, in stead of more. And that IS an economists business. This story, however, will not last. Just because the structure of production is geared less and less to the needs of the population, less and less profits will be made. One can only eat so many hamburgers, before having health problems. One can only ruin the minds of young people for some time, before companies find out they are graded idiots. One can only suppress symptoms of sickness with pharmaceuticals for some time, before people go stark raving mad. Very soon, it will show that our economy is not profitable at all, but has been consuming capital. Not by selling houses and living of the rents, but by subtle force of inflation, devaluing just about anything: money, grades, relationships, and even concepts. That this system is bound to crash, is obvious. Because the structure of production is less and less geared towards the market, the economy is less and less profitable, which makes the fiscal capacity shrink. The biggest lender of all, namely, is government; the very reason one bank was given a license to create a form of debt that everybody has to accept as a form payment is because the government always wanted to be sure of its ability to loan: we make sure that your debt titles are legal tender, and you make sure that we can lend whatever we want, which will enable us to buy votes. It is the perfect match. As the government propaganda to keep consuming, “because that is good for the economy” wanes, people start to realize that their real needs lie elsewhere. When grandpa needs nearly unaffordable medical attention, suddenly the new IPhone 5 is not seen “a real life saver” anymore. The whole structure of production, geared towards the production of capital-intensive stuff, often even paid for by consumer loans, shifts back to its normal free market proportions, liquidating those branches of the economy that should not have existed in the first place. It is this event that we call a crisis: the macro-economic illusions of policy makers are punctured by the micro-economic decisions of regular people like you and I. In a free market, shifts like this are no problem, because they are small. People who get fired, easily find a new job, and there is far less debt, or even none. In an unfree market, like ours, these shifts are a huge problem, not only because the companies that go out of business during that shift are heavily indebted and cannot repay their loans, which sets off a liquidation cascade of other bank investments that depend on it, but also because this necessary shift has been postponed time and again by injecting new money to boost demand. While vital laws of reality – for instance that you cannot eat your cookie and have it too – have been denied for decades, reality now breaks through with the sum of its deferred forces. Politicians say that markets don’t work? They work like never before. This shift is deadly to government finances. During that shift the economy temporarily produces fewer profits, which means that less tax can be collected. But the interest payments do not wait. The only way to fill the gap between revenues and expenditures is by borrowing even more, which means, in our system, that even more “money” is injected into the market, creating ever bigger distortions of the structure of production, resulting in even fewer profits, reducing the tax revenues even more, igniting yet another round of borrowing. It really is a “perpetuum culpabile”, a never-ending amassment of debt. One might say this is a fairly long introduction to the actual subject of this talk, but how can one say anything sensible on the euro if one does not know how money originated from the market, how its production was collectivized by the government, what the real purpose of central banking is, what it does to the structure of production, and why this monetary system is bound to fail? All this knowledge is lost, and certainly in Flanders, Austrian Economics, the theoretical school I draw from for this lecture, is not taught at any economics department at any university. At most, it is mentioned as a heterodox theoretic side stream in economics, while it is as orthodox as economics get. But now, let us use this knowledge to analyse the euro problem. We know that the euro is a centrally planned currency, suffering from all the problems that arise with this form of economic governance. But the euro faces even a greater economic problem, and that is the problem of the commons. In fact, “the” euro does not exist. It is a name for all the currencies emitted by the central banks of 17 countries. There are Greek euro’s, German euro’s, French euro’s, Dutch euro’s. Every euro has the same face value, but the debt that is emitted to back the currency, is often of a wholly different quality. And what is more: the more debt each state incurs, the more money it gets from the ECB. Debt is money, and money is debt. If you would doubt this last sentence, then let’s see in detail how the monetization of debt really works. It is quite easy, actually. When a government needs money, it emits a bond. This bond is bought up by the central bank. With what money? With no money at all. What the ECB does, is not “printing money” as it is often said in colloquial speech, but printing paper scripts which it calls money, but in reality is credit. Governments cannot make money, nor can central banks. Only entrepreneurs can. The bank notes the ECB produces do not represent present value, but future value: the promise that the state, which has given its debt obligation as collateral, will repay the full amount of the loan it took with the ECB after some time. If you have missed something here, it is not your fault: yes, the collateral for the loan the state takes with the ECB is a debt obligation, and yes, the ECB pays the state with new debt obligations, which are disguised as money, by painting them in all kinds of colours, and offering them in small denominations. But, theoretically, there is no difference whatsoever between a government bond, and fiat paper money. The fiat money that you have in your pockets tonight is not a property title, but a very liquid debt title, with as collateral the promise that you will pay the underlying value of it back trough taxes. In short: debt is money, and money is debt. If all debts in our economy would be repaid, there would no longer be any fiat paper money. So what happens when every national political elite can incur debt, but nobody has to incur the full cost of a devalued currency? If France printed too much money in the old days, the French Franc lost value in international exchange. If it prints too much money today, the loss of value is shared with 16 other economies using that currency. In each and every one of those countries, imports will become dearer, even though if they themselves would have maintained a healthy monetary policy. The euro is the swimming pool in which everybody urinates: everybody can externalize the cost of getting out of the pool and going to the bathroom, and yet nobody is responsible for the water getting dirty. The price is paid by all the other people using the water to swim in. The only way to prevent the externalisation of costs is to inextricably link them to the profits that arise from exploiting the same good. That is the function of property rights: if we would privatize the seas today, they would be clean tomorrow. The only reason they are as filthy as they are, is because everybody can externalize the cost of cleaning ones oil tanker by doing it at sea, which is nobody’s property, in stead of cleaning it in the harbour, where at least somebody has to be paid to process the waste. Property rights are what tie costs to benefits. In a purely free market society, there is no way to externalize costs. Socializing ones losses is only possible if there is a public good to socialize it to. The euro is not any different. Using the commercial banking system as a proxy, there is an intermediate step in the monetization of debt in comparison with the Federal Reserve System, but in essence, it is just as much a case of externalizing costs as the example of the swimming pool: the cost of unsustainable national policies is socialized into the public good which we call the euro, with nobody being there to halt the loss of value of that currency. The result is an ever-accelerating devaluation of the purchasing power of the currency, leading, in the end, to its final collapse. In the last century alone, approximately one hundred fiat paper currencies have found their grave. That is one each year. Why would the euro be any different? If it were not for the 15 % gold and gold receivables on the balance sheets of the ECB, the euro would certainly end up in hyperinflation. But even concerning this gold reserve, as we have learned from recent reports in the media, the situation does not seem to be quite clear. A lot more can be said about the euro, but this can suffice as a quick introduction. It is a fiat paper currency, which means that it is backed by nothing more than the belief that some day, all the incurred debt will be repaid. But, by virtue of the very architecture of this system, every repayment must happen with new debt, which transforms debt payment into debt creation. It is true monetary perversion, carried to its fullest extent. But a correction is underway, and this I can state with metaphysical certainty. Regardless of what people are made to believe, central planning violates the axiom of economics – namely that values are individual – causing distortion in the structure of prices and therefore also in production. With each company being rescued, each country being saved, a new emission of debt is being monetized, distorting the price system even more, reducing profits even more, lowering the fiscal revenue even more, inducing governments to borrow even more. Whether people are lied to or not, believe it or not, are ill-informed or not, this system has to crash, by metaphysical necessity. Scissors beats paper. Reality beats propaganda. Vienna beats Cambridge. This article is written by Brecht Arnaert who is the editor of www.safecapital.eu, an in-depth newsletter for preservation of capital, with the support from Global Gold. © 2012 Copyright goldsilverworlds - All Rights Reserved Disclaimer: The above is a matter of opinion provided for general information purposes only and is not intended as investment advice. Information and analysis above are derived from sources and utilising methods believed to be reliable, but we cannot accept responsibility for any losses you may incur as a result of this analysis. Individuals should consult with their personal financial advisors.